The Esplanade Hotel is an imposing three storey plastered brick building. Its three-sided facade is aligned so that the Hotel entrance faces Victoria Road - Queens Parade junction. The hotel was built by the Great Northern Brewery Company Limited on the former site of Holmes Brothers 'Flagstaff Hotel', which had opened in August 1864. The old hotel was moved to an adjacent site in Queens Parade, so that the new hotel could be built. The old wooden building was used as a staff residence and boarding-house until it was demolished in 1938. The hotel opened in June 1903 and cost a total of 7,000 pounds. The Esplanade quickly became the Auckland region's most popular seaside resort hotel, and one of Edwardian New Zealand's premier tourist facilities. The Hotel was extensively renovated and restored in 1996. 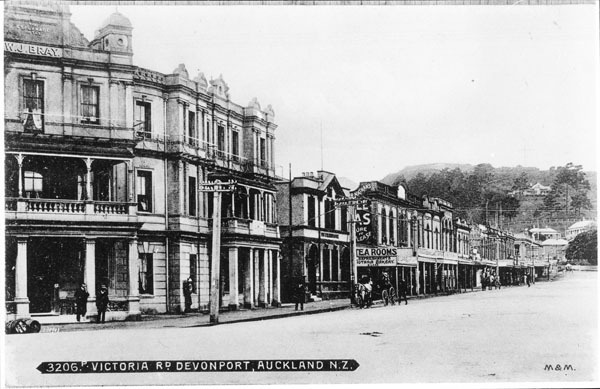 The hotel has been described as the most notable and best preserved Edwardian sea-side hotel in the Auckland region, and possibly New Zealand. 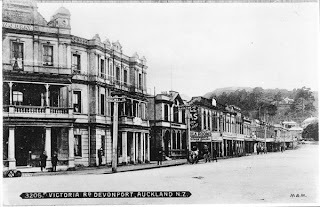 It is registered by the New Zealand Historic Places Trust as a Historic Place Category 1. 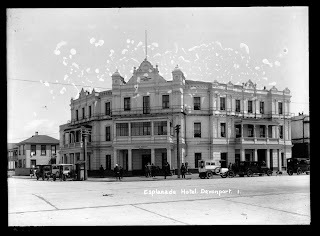 More information about the hotel can be found in Auckland Council's 'North Shore Heritage Volume 2: North Shore Area Studies & Scheduled Items List' and the 'The Esplanade Hotel, Devonport, Auckland: research project' (1997) by Felicity Gamble.